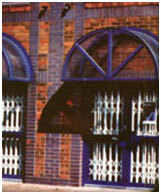 Internal and external security window gates come in various styles, and are ideal for any retail business, factories, homes, schools, etc. Behind the attractive exterior lies the uncompromising strength, each gate is manufactured from pre galvanised rolled steel. Multi point locking from a single key ensures excellent barrier security while also making it quick and easy to open and close. 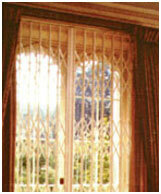 The security gate system combines the highest level of protection for your home or workplace with very classic lines.